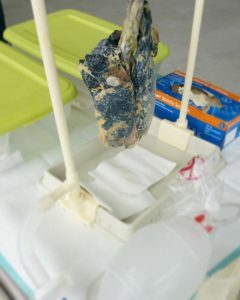 Last Wednesday was the World COPD Day. I contacted Sheery Tse RRT from Markham-Stouffville Hospital (MSH) to inquire about her plans for the lung health awareness display. I met Sheery at the Respiratory Centre and took few items to Cornell Community Centre and Library. While setting up, we were joined by MSH staff, vendors, educators and volunteers (including current and previous patients of the hospital). During my four hours there I met many individuals ranging from those who read and saw the e-mails and brochures, hospital staff who were visiting the community centre during their lunch, and members of community who were at Cornell Community Centre for other activities. It was amazing to watch Sheery and the other volunteers interact with people, listen to their questions and concerns, and share their thoughts and the printed documents. Four of the volunteers were COPD patients who have benefited from Sheery’s hard work at the COPD Clinic. The volunteers were inviting, caring and open. They would start conversations with people, tell them their story and of their struggles which allowed people to open up. People saw hope. They realized that they are not alone. Some people for the first time recognized that it is not too late to quit smoking. 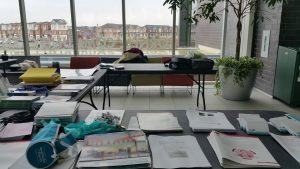 They were motivated to read up about COPD, and to seek consultation from doctors, interprofessional health teams, and to utilize the support systems available to them. My role was to share my experience and knowledge as a respiratory therapist while ventilating healthy and “smoker” lungs for observers. I suggest that you find volunteering opportunities in areas that interest you. Don’t necessarily think of it as what you are offering for “free” (i.e. your time and experience), but rather, think of the invaluable experience you are gaining. You could receive a sense of satisfaction that you have made a difference for that organization, make a connection with other driven people, make a difference to the people you meet, and get exposure to people, stories, projects, and perspectives that you may have missed if you maintained your daily routine. This volunteering opportunity encouraged me to more openly connect with people who stepped forward to have a conversation, those who opened up, those who allowed themselves to express their feelings of joy, concerns, fear and confusion. It helped me realized that despite my busy schedule, I still have free time to contribute. While experiencing a slightly busier week, I felt more energized and driven. What are some areas that you would like to volunteer in? How often you would be able to make that commitment? How much time you can free up by reprioritizing the activities in your day or week? What are some of your strengths, skills, knowledge and resources that you can offer? What are areas that you can benefit from by volunteering? Who are the people you need to get in touch with to make it happen? Ask yourself these questions if you are curious about finding a volunteer opportunity to suit your skills and interests. Then reach out to the organizations that you have interest in to start a conversation about where your skills and interests match their needs as an organization.